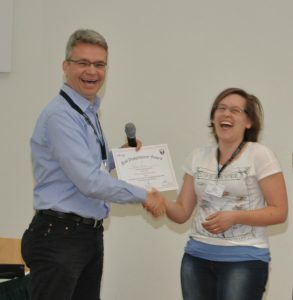 Antje Hirsch was awarded with one of the poster prizes for her Lightning Talk and Poster during the DGK Meeting in Karlsruhe. She started out in her bachelor studies with Earth Sciences at CAU in Kiel. There, she was introduced to crystallography by Prof. Depmeier and immediately fell in love with the subject. After she finished her bachelor studies, she moved on to the RWTH in Aachen to do her master’s study in Applied Earth Sciences. During that time, she also worked as a research assistant from and was offered to extend her work that as a PhD project. What fascinates you most about monazite? Monazite is well known in the communities of mineralogy, ceramics and nuclear waste management. It has been studied a long time with the result that although the compositions may vary a lot, the physical, chemical and mechanical behaviour is somehow predictable. While some of my colleagues say smiling “Oh, the trend is linear… again… how boring”, for me, it’s fascinating to see that it still is even though we did so many different analyses. Especially, if monazite is to be used terms of a nuclear waste matrix, that is exactly what we want it to be: predictable and similar in its behaviour. In your opinion, what impact could your research have on the storage of nuclear waste? What was the biggest obstacle you had to face so far and how did you solve it? I have to admit since I’ve been working on a BMBF project with many partners from other research facilities, universities and industry, I can’t recall big obstacles. It’s because the teams worked pretty well together and we had a lot of interaction and cooperation. Concerning writing my thesis, the biggest obstacle is definitely my micrology (and sometimes even pedantry): I think I am worrying too much about too many little details instead of keeping up the whole picture. However, I figured out that I need to write my text and include all my thoughts in comments. After a week or so, I read my text and my notes and decide how I like to deal with the ‘problem’. If I can’t find a satisfying solution, I am asking my supervisor and colleagues. That was maybe one of the biggest hurdles that I had to overcome: asking for help. But my colleagues are nice so there is no need to be afraid. You name a lot of people in the acknowledgement section of your poster, how important is teamwork for you and your research? For me, teamwork is very fulfilling. I like to talk to other people about my ideas and perspectives, to brainstorm about a specific topic or how to solve a ‘problem’, and to get and to give explanations and help. All the teams I’ve been working with so far no matter if a Ph.D. student, postdoc or professor, I found myself in an unconstrained environment with open-minded listeners and advisers. What I learnt is that you don’t need to feel bad for not knowing things or just understanding half of the ‘problem’ as long as you are willing to get to know new approaches. But teamwork is not only discussions. It’s also sharing an amount of work so that everybody can contribute in his best way. 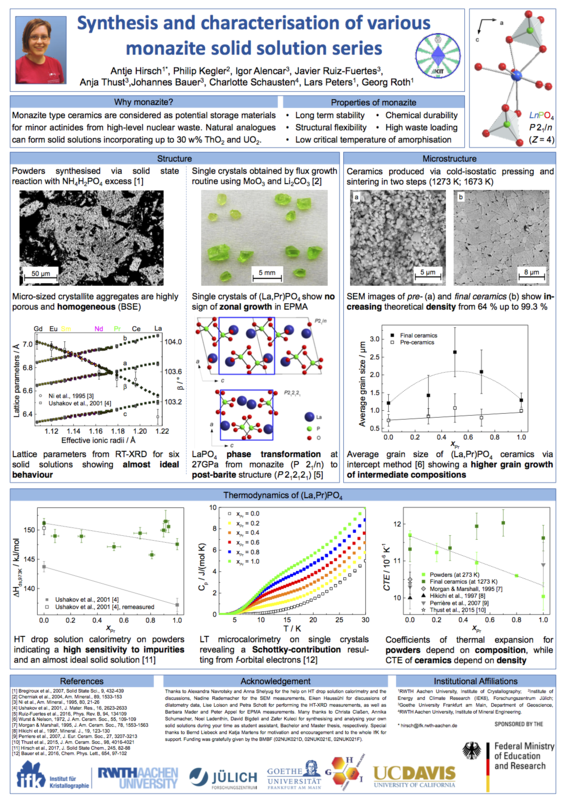 That’s not only for sample processing and analysing but also for the evaluation. TEAM stands for “Together everyone achieves more” and this is exacty what I like about teamwork.